Poly accepts 18 to 20 students for grade 6 and 10 to 12 students for grade 7. Grade 8 is considered a “non-entry” grade and applications to that level will only be considered if space is available (e.g., through attrition). Complete and submit the online application and pay the $100 application fee. Teacher and Administrator Recommendation Forms are requested online. 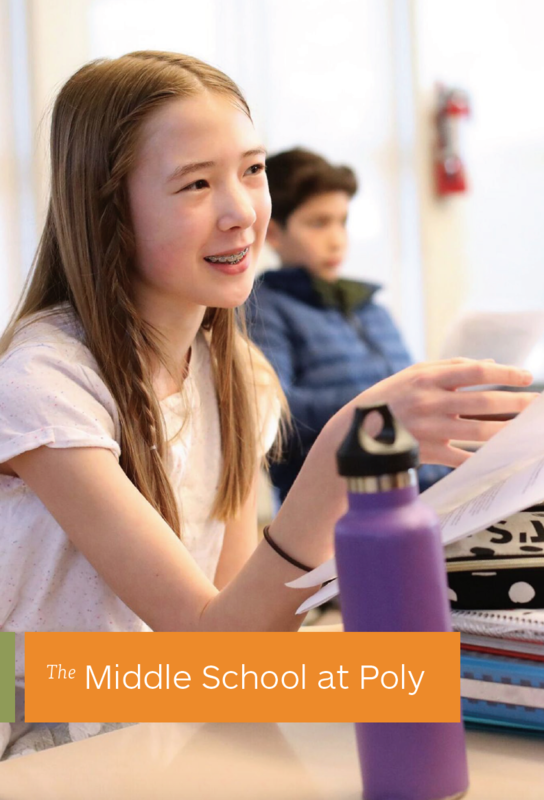 Middle School applicants should request recommendations from their current math and English teachers and from one school administrator (principal, program director, counselor, etc). The applicant's teacher will receive a secure link to a confidential recommendation. Students must take the ISEE and may take it at any available site. Please designate that Poly is to receive the exam results by entering our code: 052402. Poly encourages students to take the exam only once during the application season. Should we receive more than one score report for an individual, only the first set of results will be considered. Visits are a required part of the admission process. This casual group visit is an opportunity for us to get to know your child on a personal level. Grades 6-7 do not have individual interviews. Please note: We encourage families to sign up early to ensure they get a date that works with their schedule. Required for: Grades 6-7; Grade 8 applicants will be contacted individually to schedule an interview. Poly asks for reports from the previous school year and first semester reports from the year students apply. The transcript request form can be found online and should be signed and given to your child’s current school. Poly requires all transcripts to be sent directly by the school. Poly asks applicants to complete a set of short answer essay questions in order to get to know them better. These questions should be completed by the applicant alone so that we can also get a sense of their writing style and authentic opinions.